Lehmann Audio Black Cube SE II is a true audiophile phono stage to enjoy superlative performance from your turntable and cartridge for the enjoyment of your vinyl. Thanks to its small dimentions, the Black Cube SE II audio section can be placed next to the turntable. 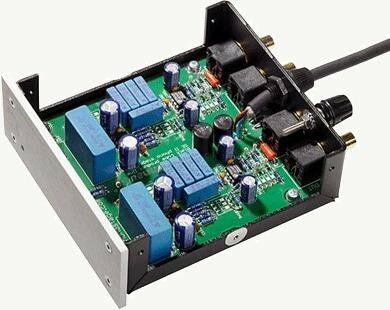 Lehmann always pays special attention to details: the cable between power supply and audio section is shielded and ensures flexible placement of audio section and PWX power supply. The cases of both th power supply and the audio section are made of non-magnetic aluminum; additionally equipped with a top cover coated with a special anti-resonance treatment for better suppression of microphonic effects. A brand new feature that is built into the Black Cube SE II is the entirely passive bass filter, that is a great help when tayloring the lower corner frequency of the vinyl reproduction to personal needs. 16 different filter curves can be realized.